Did you know it's smoothie week? Well, it is over at Williams-Sonoma and they've asked me to whip up a smoothie using a unique ingredient. I'm not sure why, but Whoppers Candy was the first thing that popped into my head. Maybe because I had a huge bowl of Halloween Candy sitting next to me and they were calling my name! Regardless of what inspired this delicious dessert smoothie, I was super pleased with the result! This smoothie is a perfect way to add some dairy and fruit to your day while satisfying your sweet tooth at the same time! So, go ahead and raid your kids' Halloween candy and get your blenders ready to whip up this yummy, almost-guilt-free treat! 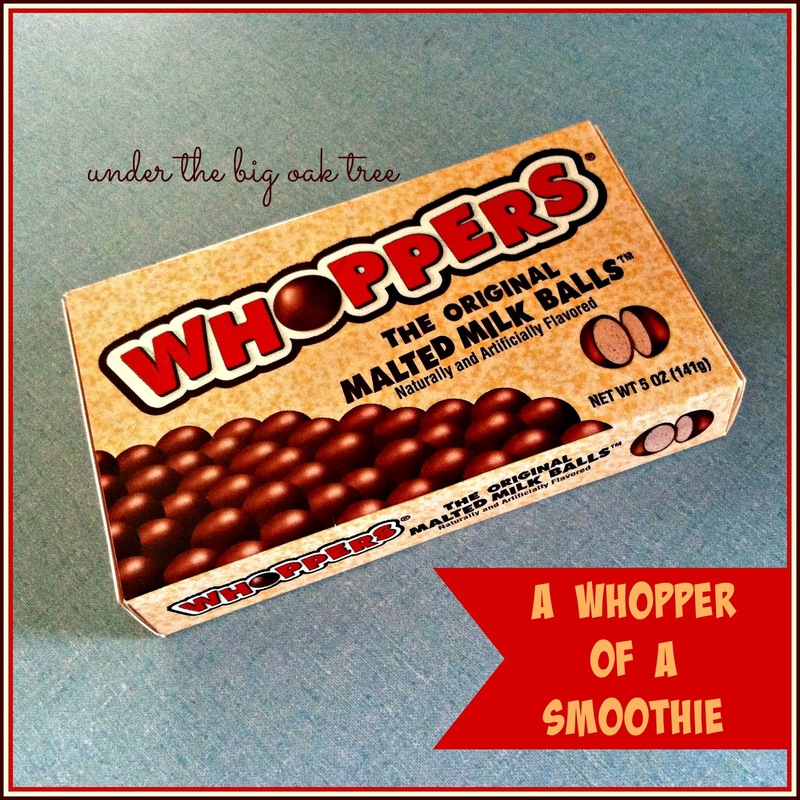 While Whoppers Candy isn't something totally off-the-wall unusual, it is a bit of a jump from my normally healthy smoothie ingredients. You'll want to crush those candies and that's really easy to do! Just pour the candy into a zipper bag. Seal the bag after squeezing out the air. 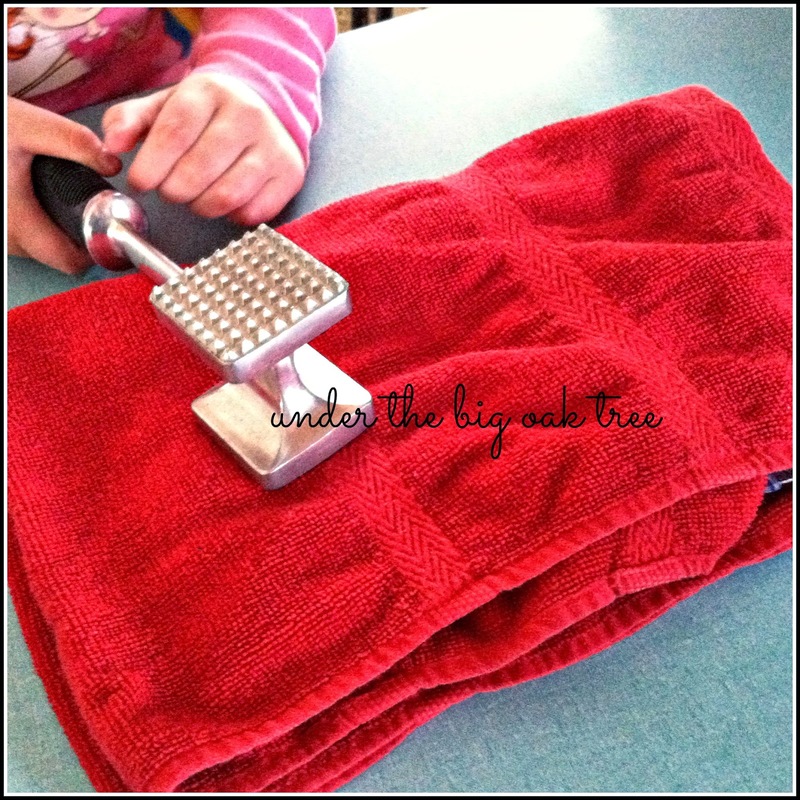 Place the bag of candy into a folded dish towel and crush the candy by whacking it with a meat mallet or rolling pin. Grace had fun helping me with this part of the preparation! 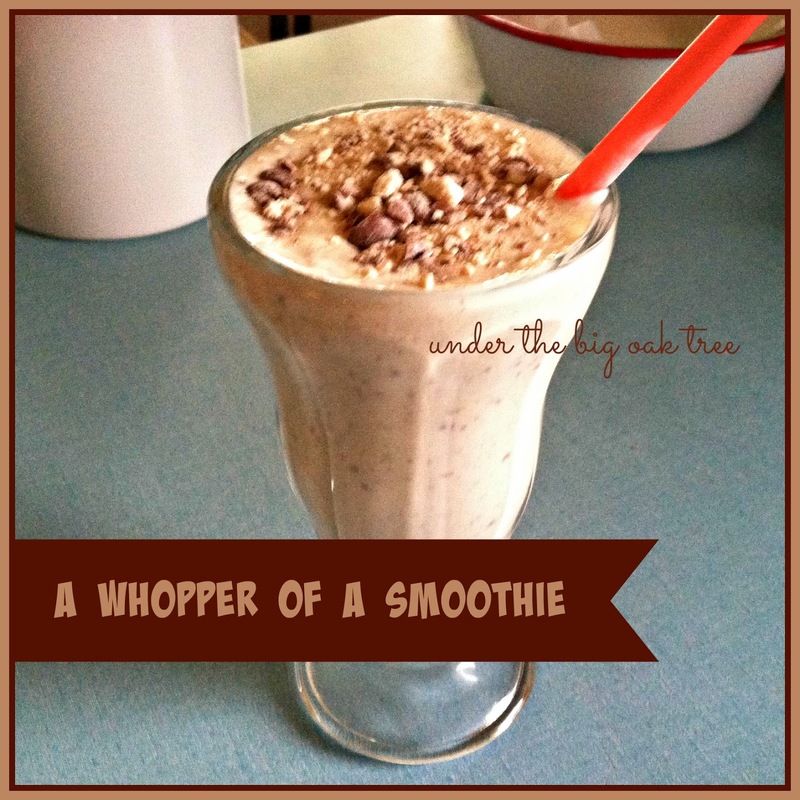 Grace and I crushed up a movie theater sized package of Whoppers because I wasn't sure how much I'd need for this smoothie. I love that we have enough to make at least 2 more smoothies! This is great because normally, I'd sit there and just devour the entire box, but by adding some of the crushed candy to healthy smoothie ingredients, I was able to enjoy a sweet treat without feeling too guilty! Now that we've gotten past the candy crushing, scroll down for the recipe! Garnish with additional Whoppers Candy. Creating this smoothie recipe started me thinking about a dessert I used to get as a kid and how I'd like to transform the concept of that dessert into another dessert smoothie...so be sure to check back soon for more healthy dessert options! In the meantime, check out my latest recipe for a Ginger Snap Pumpkin Smoothie. 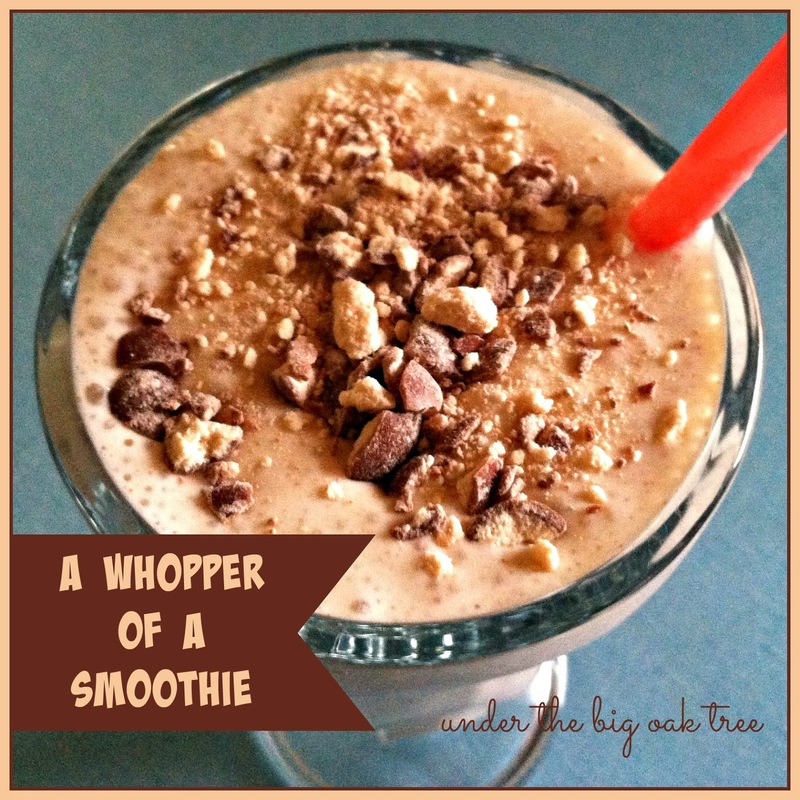 The delicious flavors of fall in a tasty breakfast smoothie! Psst! It's great for dessert, too! Disclaimer: I was not compensated for this post in any way. All ideas and opinions shared in this post are original and my own. What a great recipe! 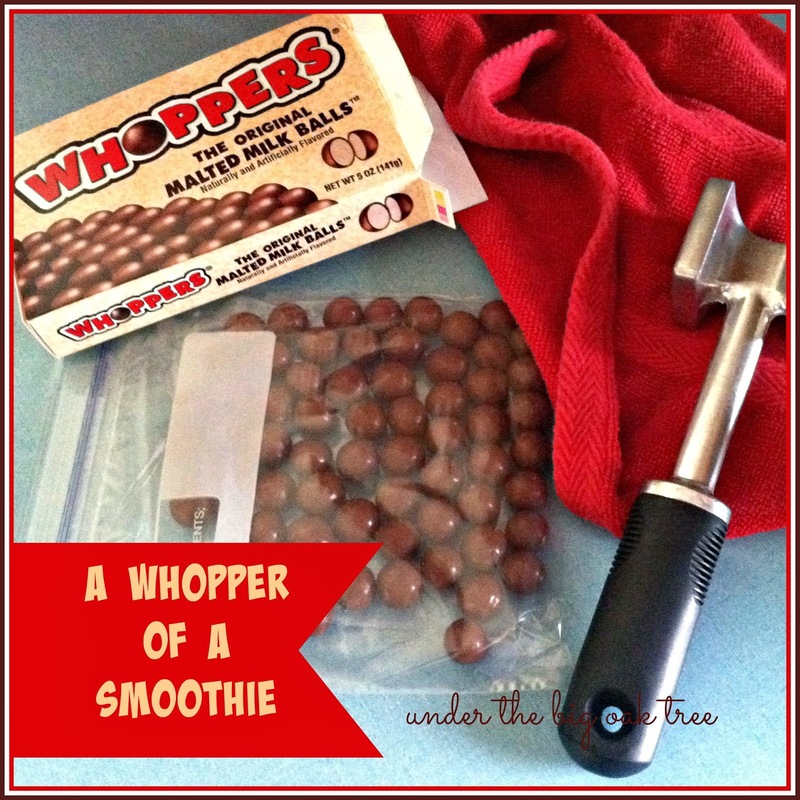 My dad & my daughter both LOVE whoppers, so I'll definitely have to this out on them next time my daughter & I are visiting my parents!